For an event, Bollywood celebrity Sophie Choudry surprised us all by stepping out looking like a stunner in all red. She wore a fiery unique look and we couldn’t help but stop and stare. Red on red (on red) a tricky trifecta to pull off but if nailed to perfection, it’s pure magic. Sophie is proof of that. She brought together the bold look with an interesting mix of prints and tones leading to absolute slayage in the style department. 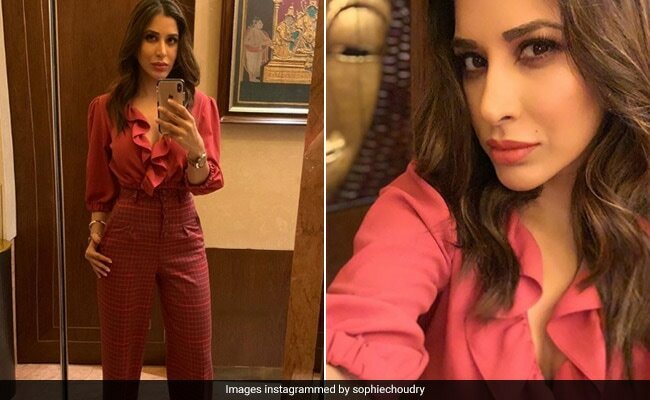 To get Sophie Choudry’s red look and experiment with your style, here’s what you need. For Sophie’s bright red blouse, choose the Badge Casual Solid Red Top. With its bright shade and ruffles running down the neckline, it’s a great dupe for the celeb’s pick. It is available for Rs 419 from Rs 1099. Sophie’s choice of trousers were a few shades darker and printed. To get a similar look, pick the Style N Shades Red Trousers. Sans the check print, its style and fit works itself well into the outfit. It is available for Rs 299 from Rs 1399. Sophie topped her outfit with shiny red pumps, which you can get with the Shuberry Patent Pumps. Right from the gloss to the point in front, it’s almost identical to what this celebrity is wearing. It is available for Rs 1197 from Rs 2395. Sophie topped off the bold outfit with a muted red lip. To get it, apply the Sugar Matte As Hell Scarlett O’Hara Lipstick. It is available for Rs 719 from Rs 799. If the bright combination is your wish list, try it with these picks right away.